The iPhone X is finally here. It's a pretty amazing smartphone, but today, I only care about one thing: how well can it shoot video and can it be used as a professional tool. 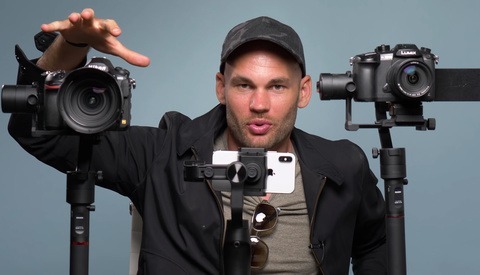 Now before you start whining about what is and is not "professional," let me go ahead and tell you that we use our smartphones to film paying jobs all the time and we've made a lot of money with them. That's my definition of "professional." We filmed a promo for the new Fuji GFX and iPhone 6s and 7 footage is sprinkled throughout it. You'd never be able to tell which camera shot which footage. That being said, a smartphone isn't capable of shooting everything well and so we decided to put our new iPhone X to the test. We recently switched over to filming 100 percent on the Panasonic GH5. It's an incredible camera in a small form factor, at a killer price. We currently own five of them and I decided to compare the iPhone X to our camera of choice. 4K at 24fps is our go-to settings 90 percent of the time. The GH5 footage looks fantastic and shooting in the Cinelike D profile gives us extra latitude to grade the footage in post. The iPhone's footage is recorded with a very vibrant look baked in. The colors are bright, the scenes are always extremely contrasty, and the darkest shadows are always very dark but rarely underexposed. Everyone in our office liked the footage out of the iPhone better than the raw or graded footage out of the GH5 at first glance. After zooming in, however, it became easier to see that the GH5 had a significantly sharper image and a higher bitrate. I didn't mention this in the video, but the second clip of the chairs by the water was taken with the second "telephoto" lens on the iPhone X. This lens seems to have around a 55mm equivalent focal length. This second camera and lens performed very well and is obviously a massive upgrade to the "digital zoom" on other smartphones. The GH5 was one of the first cameras in its class to shoot 4K at 60fps, and now the iPhone can as well. 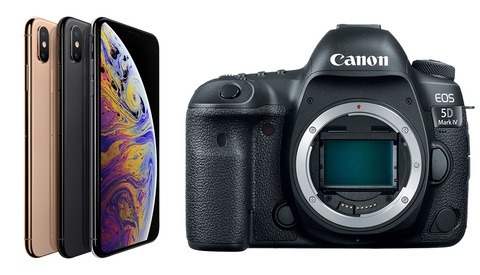 Surprisingly the iPhone once again held it own against the GH5. The footage looked incredible straight out of the phone. The GH5 can shoot up to 180fps at 1080p, but the footage looks much better when shooting at 120fps. Shockingly the iPhone is also capable of shooting at 1080p 120fps. I filmed my dog jumping around with both cameras and I am happy to say that the footage out of the iPhone is still fantastic and totally usable. Just remember that as your frame rate goes up, so does your shutter speed, and you'll need more light to capture clean footage. 120fps outside in the middle of the day will always produce great results. Ninety-five percent of the time we are using our iPhone to capture "professional" looking footage, we are using it with a gimbal. The optical stabilization in the iPhone 7 has given us trouble in the past on a gimbal by jerking around and ruining the smooth shot. We have not tested the iPhone X on a gimbal extensively but in our first test, the optical stabilizer seemed to work very well in conjunction with the gimbal. Of course the footage out of our GH5 was significantly smoother, but the iPhone X is still a very usable option. There are two main issues with smartphone cameras: One, they can't produce shallow depth of field, and two, they struggle in low light. The GH5 isn't a great option either when it comes to ISO performance but when we compared the two cameras, it was obvious that the iPhone couldn't keep up. The iPhone's footage is totally unusable at its maximum ISO which I am guessing is around ISO 800. Luckily the iPhone X comes with a very fast f/1.8 aperture which makes shooting in most conditions possible. The bottom line is that more light is better when it comes to any small-sensor camera. The iPhone X has dual cameras on the back (24mm and 55mm equivalent) and both of them performed shockingly well. Will this replace our five GH5s? Don't be ridiculous. But for some situations, especially those when your phone is the only camera available, the iPhone X is incredibly capable. Yes, it's even capable of shooting "professionally." If you can't justify spending over $1,000 on a smartphone, keep in mind that the iPhone 8 has the same wide-angle camera and lens. What do I want next from Apple? Honestly, I feel like the cameras are great but I would like more manual control over them. I'd like to be able to choose my shutter speed, set long exposures, lock my white balance, set the ISO, and turn the optical stabilizer on and off. We can do most of these things with the "Movie Pro" app, but it would still be nice for Apple to allow it natively. The larger the sensor area, the more photons it receives under the same aperture value, hence higher signal to noise racial. Phones usually have a shelf life of 1yr/generation, so they usually are several years ahead of the cameras. Semi-conductor industry usually put new tech on smaller units first for higher quality pass rate. Phone companies use the latest algorithms to improve the image quality, now even including AI and machine learning, while camera companies are still relying on chip based conversion. This video is mainly for the video quality comparison. Well, video image quality has much to do with the process of sampling and converting than the lens quality, 4k is about 8mp, it is nothing compares to a still image. Camera, especially high-end ones evolve slower than phones, partially due to the sensor. Camera sensors are large semiconductor unit. larger semiconductor fabrication has so much higher initial failure rate, and less potential unit sells hence much higher price. These limitations mean the same design and fabrication process has to run longer to make a profit. That is why Sony 180nm fab IMX-094 was not only used on A7r, but also D800, D800E, D810, D810A, and Pentax K1, these products announced between 2012 and 2016, meanwhile, think about how much phones evolved. Great video, really shows the gap closing. For me its the step on in dynamic range thats most impressive. What case were you using for the iPhone x? In the thumbnail it looks like a skin for the back glass but I cant tell. looks great though. In the thumbnail there is no case. I love these comparison videos! The iPhone video footage in is pretty impressive. Lee, I noticed that you mentioned the iPhone stabilization kicking in and making look as if the lens on the iPhone was auto adjusting when on the gimbal. 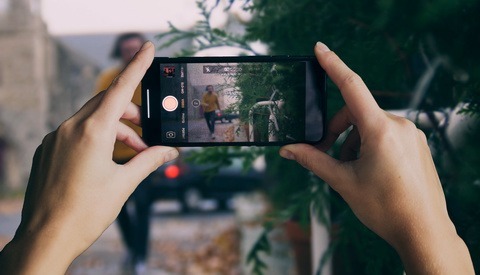 Just a thought, but did you by chance try shooting any video using an app like Filmic Pro on the iPhone? When using Filmic Pro, you can park the focus so it won't bounce around. You can also turn the stabilization on and off as well. Or were you just using the built in Apple Camera app? What app was used for filming with the iPhone? You mention Movie Pro but don't specifically mention if that was used in the video. I've been looking for a good travel gimbal for my iPhone, which one have you found works best and doesn't require a lot of balancing? What the S6 and beyond does, and probably other phones as well is taking hdr video. That's why phones have "better" dynamic range. On my S6 it doesn't work at 60fps, for obvious reasons. And I'm sure that the iphone x also does it. First location test. What happens when the battery runs out? GH5, swap batteries. Iphone, go look for one of a kind charger (in white). Great work, thanks . What is the name of gimbal you used with GH5 in the video ?